Located in the Midwest, Illinois is home to Chicago, the third-largest city in the country as well as a major sports and cultural center. Illinois has many smaller industrial cities, bountiful natural resources, and intense agricultural productivity, especially in its central region. Here are the best places to visit in Illinois. Springfield, Illinois is the state capital, and it is renowned as the birthplace of America’s 16th president, Abraham Lincoln. Much of the tourism in the city focuses on this great man, and interested people may visit the Lincoln Home National Historic Site, the Abraham Lincoln Presidential Library and Museum, Lincoln’s Tomb, and the law offices where he practiced before becoming president in 1861. Chicago is the third-largest city in the United States and has a wealth of exciting opportunities that draw millions of visitors every year. 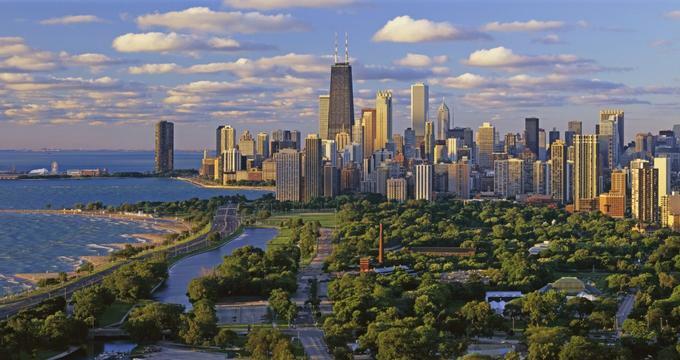 Chicago sits on the western edge of Lake Michigan, and its huge harbor system includes beaches and beachfront parks. Parkland is an important city feature; there are over 570 parks, the centerpiece being Lincoln Park, a 1200-acre space. Rockford is the second largest city in the state of Illinois outside of the Chicago Area and is often dubbed “The Forest City” due to its 20,000 acres of green space. Four rivers run through Rockford, there are several golf courses, and Rock Cut State Park is a haven for boaters and campers who enjoy its pristine lakes and hiking trails. Rockford is proud of its history, which visitors can learn about at Midway Village, a pioneer village with costumed docents and historical exhibits. The Burpee Museum of Natural History is dedicated to an even earlier regional history, and it has a terrific dinosaur exhibit that includes a complete T-Rex skeleton. Evanston, Illinois has a charming downtown where you will find a great selection of theaters, music venues and restaurants. Home to Northwestern University, Evanston is a stylish suburb north of Chicago where you will also find the historic Grosse Point Lighthouse, built in 1873. The lighthouse was put in place in the aftermath of several shipwrecks by water craft running onto the shallow shoals of Lake Michigan en route to Chicago. It was, for its working life, the brightest and lead lighthouse in the area. On a sunny day, take the kids to Lighthouse Park, a green space with a children’s playground and a beach with picnicking sites. Find more weekend getaways from Chicago. Bloomington is the 12th largest city in Illinois and has a sister city, Normal, which shares in its civic decision-making. The area was first used as an encampment for the Kickapoo Native Americans until Euro-American settlers reached the rivers and groves of the city in 1820 and put down roots there. Bloomington-Normal is a municipality with many faces. Outdoorsy people love its forty-four different parks and its three golf courses. Lovers of the arts can enjoy theater, the symphony orchestra, and the city’s ballet corps. The area has a small but fascinating zoo, which has some of the rarest wild cats in existence: the Amur Leopard and the Sumatran Tiger. A huge indoor rock climbing park is a great favorite amongst both visitors and locals. Galena, Illinois is a small city of under 4,000 inhabitants in the most northwestern corner of the state. More than 85% of this historic town is a National Historic District, and it is renowned for its architecture and its long mining history. Before Europeans settled here in 1821, Native Americans mined the area for over a thousand years, and they brought the mineral galena, a lead oxide, out of the earth. Quincy, Illinois is situated on the bluffs overlooking the Mississippi River. Dogwood-lined streets and fine architecture, much of it in traditional German style, make this city a lovely place to visit. Quincy has a rich history; it was a safe haven for Mormons leaving behind the persecution they faced in the eastern states and was a major stopping point on the Underground Railway, which helped African American people flee the south and slavery. Like many cities on the Mississippi, Quincy has a heritage of blues music, but it also has an annual film festival, an excellent opera company, and a fine theater. Alton, Illinois is only fifteen miles north of St. Louis, Missouri and is considered a part of the Greater St. Louis Metropolitan Area. Known for its limestone bluffs along the Mississippi River, the city and its surrounding area offer lovely drives along the Great Rivers Scenic Route. Archeological artifacts of the city’s prehistory can be viewed in the National Great Rivers Historic Museum, and outside, a prehistoric painting of a piasa bird can be seen on a cliff face. Alton is the hometown of jazz musician Miles Davis, and it was the site of the final debate between Abraham Lincoln and Stephen Douglas in 1858. From its humble beginnings as a Mississippi ferry-crossing, Alton has grown to be an important center for the arts, particularly theater. Elmhurst, Illinois is a western suburb of Chicago with a population of approximately 45,000 people. It is a center for the arts with a fine art museum that offers classes to adults and children. It also has a symphony orchestra and theater groups and performances. The Lizzadro Museum of Lapidary Art draws many visitors; its focus is on cutting and polishing stones and displaying them as works of art. The city of Elmhurst is a terrific place to go shopping with a downtown core offering nearly three hundred unique merchants. Plenty of family fun can be had at the indoor trampoline park in town. Abraham Lincoln, the 16th President of the United States, was born on February 12, 1809 in Hodgenville, Kentucky. Largely self-taught, he passed the Illinois Bar and began his career as a lawyer in Springfield, Illinois under the tutelage of his wife’s cousin, John T. Stuart. Before and after his terms as a member of the U.S. House of Representatives, Lincoln and his partner had a successful law practice in Springfield, and it was in this town that he married and had four children. Abraham Lincoln was elected President on November 6, 1860 and led the country through the Civil War. On April 14, 1865, he was assassinated by a Confederate sympathizer in a Washington, D.C. theater, and his body was brought home by train to Springfield at the request of his wife. Lincoln’s Tomb is in Oakridge Cemetery and is open to visitors year-round. The Anderson Gardens in Rockford, Illinois were inspired by visits Rockford businessman John R. Anderson took to Japan and to the Portland, Oregon Japanese Garden. He and a Japanese architect, Hoichi Kurisu, designed the Japanese garden, which started as a private venture on Anderson’s property. Considered the finest Japanese garden in the United States, it is designed in the fashion of a 13th century strolling garden with numerous water features, winding paths, rock formations, and a bevy of Japanese maples, cloud pines, rhododendrons, azaleas, and magnolias. Fish, ducks, and minks are part of the background of the garden, which is now a not-for-profit organization with all funds going towards charitable works. It is a perfect place to leave the stress of the world behind and where you can return to serenity and peace. The Riverwalk in Naperville, Illinois is a peaceful and scenic place to stroll along the west branch of the DuPage River. This 1.75-mile pathway is paved with brick, and it is beautifully landscaped and dotted with fountains, bridges, sculptures, artwork, and meeting and event spaces. A café with an outdoor patio overlooking the river serves pub-style food and ice cream. Many retail shops are located along the Riverwalk, as is the popular Centennial Beach and Centennial Park’s skateboarding/inline skating facility. Visitors may rent kayaks and paddleboats or take children to the Jaycee playground. Midway along the Riverwalk is a bell tower, the carillon of which lyrically chimes every hour on the hour. 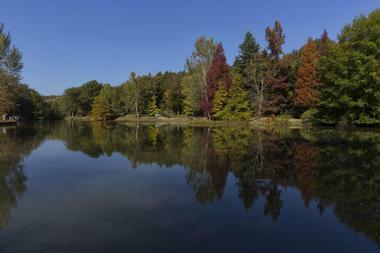 The Morton Arboretum is a world-class facility in Lisle, Illinois in the Chicago metropolitan area. Set over 1700 acres, the arboretum has sixteen miles of hiking trails and other paved routes for driving or cycling. Its many offerings include a fragrance garden, a ground cover garden, and a maze. A children’s garden helps introduce youngsters to arboreal conservation. Morton Arboretum has extensive educational programming for people of all ages, including cooperative programs with local colleges and universities. The Sterling Morton Library has over 27,000 works about trees, botany, and nature. The gardens have a gift shop and a café, and visitors can rent bicycles to explore the paved trails. 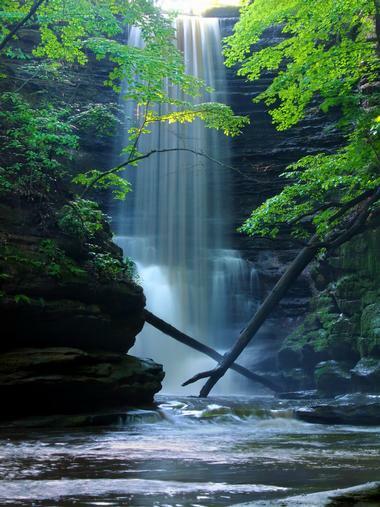 Starved Rock State Park is the most visited attraction in the state of Illinois. 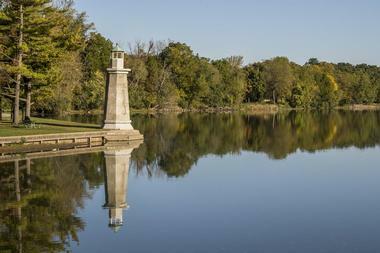 Less than one hundred miles from Chicago, this National Historic Landmark is alive with beauty. There are canyons, tall, tree-topped bluffs overlooking the Illinois River, and thirteen miles of hiking trails to bring visitors closer to the natural charm of the park. Fourteen of the eighteen canyons have waterfalls, and guided hikes through these canyons are available and are the safest way to explore. The park has a guest lodge and a campground while a small camp store serves the needs of overnight visitors. Day visitors may use the picnicking areas, which have several shelters, drinking water, picnic tables, and restroom facilities. From late December until March, Starved Rock State Park becomes a center for viewing migratory bald eagles; thousands of them flock to the park each year. 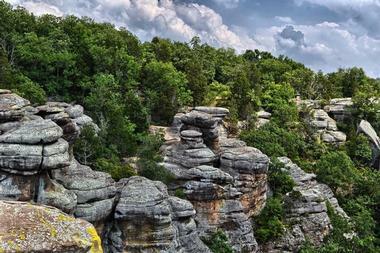 Shawnee National Forest is located in the southernmost part of Illinois in the rolling hills of the Ozarks and the Shawnee Hills. It is a variety of eco-systems: unique rock formations, oak and hickory forests, thriving wetlands, swamps draped with cypress trees, prairies liberally sprinkled with wildflowers, and the meandering Ohio River. Over its 268,000 acres are miles upon miles of hiking trails that welcome leashed dogs and horseback riders. Primitive campgrounds are available, as are simple cabins. Visitors to the park can enjoy trail walking, picnicking, fishing, or spotting wildlife, which includes large herds of deer. There is a Visitor Center and extensive educational programming for all ages. 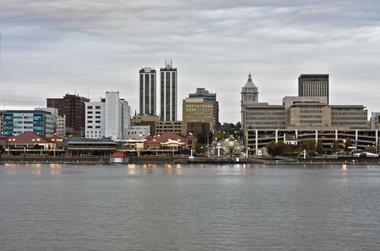 Peoria, Illinois is a city situated on the Illinois River. It is named for the Peoria Indians and was founded in 1691 by the French explorer Henri de Tonti. This lovely riverfront city boasts 9,000 acres of parkland, and it serves as the headquarters for the American machinery giant, Caterpillar, Inc., which employs 93,000 people. When Colonel George Fabyan and his wife Nelle bought significant acreage in northern Illinois, they had a home built for them by Frank Lloyd Wright, a home that after their deaths became the Fabyan Villa Museum. Col. Fabyan also had a Japanese garden constructed, which today is open to the public, and it is a peaceful and quiet refuge from everyday life. In the 1920s, the Colonel had a large Dutch windmill moved from its original site and onto his land; one of the few wind-powered windmills in the United States, it is built from cypress wood and dates back to the 1850s. Around the windmill is park land ideal for picnics. The entire Fabyan estate is on the banks of the Fox River and adjacent to the Fox River Trail, and so it is a wonderful destination for fishing, walking, and cycling. 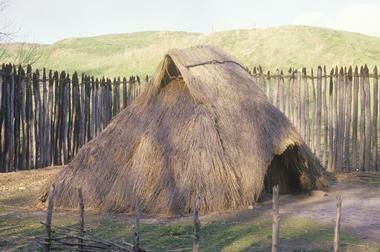 A World Heritage Site, Cahokia Mounds is the largest and most complex archeological site in the United States. It is directly across the Mississippi River from St. Louis and was once a pre-Columbian Native American city from c. 600-1400 AD when it was home to the Mississippian people. At its peak in the mid-1200s, Cahokia was home to more than 40,000 people, a population greater than mid-1200s London, England. The site is characterized by huge mounds that had significance to the people who lived here; a life-size village replica can be explored, and the excellent museum has an informative video, original artifacts, and information about the daily lives of the inhabitants of Cahokia. A self-guided audio tour of the site is available, and there are walking trails and a gift shop. A palisade is a long, steep cliff, the sort that you see along riverbanks, and at this 2,500-acre park in northwestern Illinois, they run along the shores of the Mississippi at its confluence with the Apple River. The park is rich in Native American history, and a wonderful place to see Illinois wildlife up close. There are waterfowl, shore birds, wild turkeys, and pileated woodpeckers; fishermen generally catch crappie, carp, and bass. On the fifteen miles of trails, visitors may run into white-tailed deer, badgers, woodchucks, squirrels, minx, and foxes. 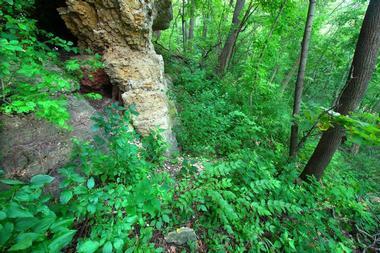 The park is dotted with colorful wildflowers and has picnic sites, and opportunities for rock climbing. It is also a seasonal favorite of cross-country skiers. 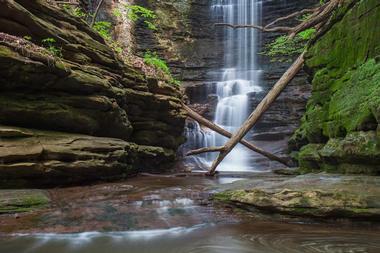 Matthiessen State Park was named for prominent industrialist and philanthropist Frederick William Matthiessen who bought the lands in the late 19th century. Over 1700 acres, the park features canyons and streams with picturesque waterfalls, all of which direct their flow towards the Vermillion River. 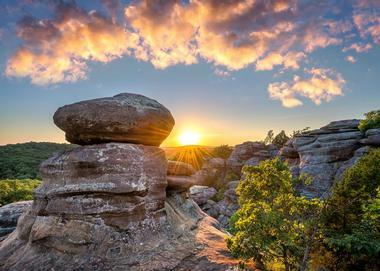 Colorful sandstone walls, tall bluffs, and forests of bluffs and cedar make this destination popular with hikers who wish to enjoy nature’s bounty. Frogs, toads, and salamanders populate the streams, and flying squirrels, white-tailed deer, indigo buntings, cliff swallows, and red-tailed hawks are in large number throughout the park. There are five miles of hiking trails with extensive stairs, which make them inadvisable for those with mobility issues. There is another nine miles of mountain biking and equestrian trails. Near the park entrance there are restrooms and picnic tables. 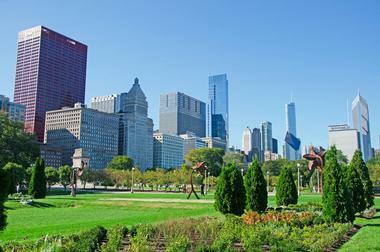 Grant Park, a 319-acre green space in the heart of Chicago’s main financial district, The Loop, is a city centerpiece with wide offerings to all Chicagoans and visitors. It is the site of the Art Institute of Chicago, the Field Museum of Natural History, the Shedd Aquarium, and the Adler Planetarium. In the park’s center stands one of the largest fountains in the world, the Clarence Buckingham Memorial Fountain, which has water displays every twenty minutes and a light show every night from 9:00 pm until 10:00 pm. Home to many music and food festivals, Grant Park also has an ice skating trail, wall climbing facilities, several play areas for children, two marinas, and a skate park designed for use by skateboarders, inline skaters, and BMX bikers. Baseball diamonds and tennis courts round out the park’s many attractions. Tunnel Hill State Trail is a cycling trail in the bed of an old railway line and was created in the late 20th century using crushed limestone for its surface. Regular bikes will have a hard time getting purchase on this surface, and mountain bikes or hybrids are recommended. The trail is very level and goes for some time through an unlit tunnel, so visitors should bring their own method of illumination. The forty-five mile trail takes riders from Harrisburg to Karnak and is very scenic, offering colorful wildflowers, Illinois prairie, oak forests, and a variety of wildlife, including red foxes, cottontail rabbits, raccoons, deer, and opossums. A bounty of songbirds makes for pleasant listening as you cycle. The trail has no services, so visitors are advised to bring in their own food and water.